“Oh, and the sickening stench of Skaven seems to be such the flavor of the season that I can’t put a spoon to my mouth without gagging from it!" In hindsight, thought the spell singer, morning was never when one would find Lord Aldaeld most agreeable. Still, things were moving faster than he had anticpated. For good or worse, he knew not, but whatever the cause the result remained the same. They must leave immediately. Time, he thought, for a different tact. Well, at least that got him to close his mouth. A shame about the frightening scowl, though, he was not very attractive to begin with. Scowling made him look like a rancorous carp. Opps. “Don’t think I don’t know what you are doing Salamandar. Such scheming does not deserve the use of your title. Though even you are not foolish enough to have orchestrated this affront, especially when no other Hall would have you. This is her doing. “Oh, you lie just as well as you dress. Go. Tell Lady Liyanevacia I wish to see her. I shall inform her how she can repay me the loan of my Kinband for her futile quest." The two eternal guards closed the doors behind him as Salamandar left poor Lord Aldaeld to fume and frighten his other attendees. As pressing and important as his current undertaking was, he still couldn’t resist sharing his small triumph even if it was with his Lord's stoical guard. “What? You haven’t heard that human adage? Honestly, you really should get out more. It must be very dull guarding a door. If you put your ear to it now and then, you might just pick up a good jest or two. Here’s one to mull over: What did the grumpy carp do when the duck stole its dragonfly? Salamandar shook his head and feigned a disapproving sigh. With a flash of light and a dramatic burst of feathers, he took wing. Salamandar the eagle then left his unsympathetic audience without a wit and without a helmet. Winter was on its way. It was time for the Asrai to fly south. Liyanevacia was not entirely sure why she tormented him so. Jealousy? Perhaps. If only she would have one devoted to her so entirely. The infatuation would be quite annoying, but the absolute willingness to please her evoked such delicious pleasures. For a moment Liyanevacia even considered changing her appearance and taking the fool to her bed. No. She thought. Better not to risk the other finding out; males were easy to control, but only until their pride was hurt. Liyanevacia was almost grateful for the interruption of her dangerous thoughts. Almost. The outcast had grown impetuous. Mayhap she was being too soft of late. He was forgetting his place. There. That felt good. Let him sulk. Liyanevacia turned her back to him and looked to the rider and her fearsome lion mount. They were much closer now. The fey-elf’s feral beauty was nothing compared to the intensity of her eyes. Cold, fierce and merciless, Liyanevacia felt an annoying stab of fear as the rider’s stare encroached upon her poise and self-assuredness. Worse, she wondered if Calanan was aware of her discomfort. Imagining his smug grin at her back, Liyanevacia’s replaced her anxiety with anger. It was a much easier emotion to work with. As she had feared, her commands were ignored. No, not ignored. Liyanevacia was not even sure that the rider had heard the words. The fey-elf’s amber eyes seemed to look through her rather than at her, and in those golden orbs she saw a rage and hatred that for one horrific moment stopped her heart. Liyanevacia began to back away until she stepped into Calanan’s arms. His hands gripped her waist to steady her. NO! Liyanevacia turned and slapped his hands away before whipping back around and steeling herself to meet the gaze of the golden-haired creature that stalked her. She would not balk at this mindless pawn of Orion. “You shall answer to the will of Ariel! You will do as I command!” Liyanevacia thrust her staff before her and called fourth the power of the magical shard within. The forest lion immediately stopped its advance and sunk down into its haunches. It roared its discomfort once, but to Liyanevacia it sounded pitiful and painded rather than defiant. 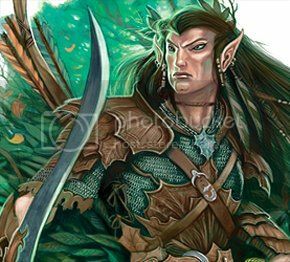 The fey-elf, however, fought. She leaped from the lion’s back with a feline grace that was spoiled only by a slight swaying as she landed and stood a few paces from Liyanevacia. 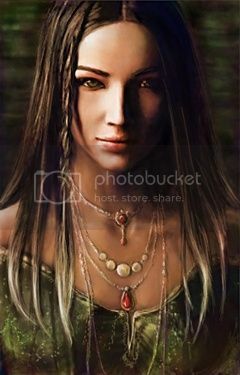 Liyanevacia drew upon more of the fimbulwinter shards’s potent melancholy and poured it into the spirit of the fey-elf. Grimacing, it took a few tortured steps forwards. With each step it spoke. Liyanevacia was loathe to draw upon any more of the shard’s power lest she herself surcome to its despair, just as its previous wielder had done. “What are you doing?” Liyanevacia heard both a reproach and plea in Calanan’s question. “You must stop. She merely wishes to tell you her story. You need not be afraid.” Even the mental and physical exertion to focus the staff’s magic could not stave-off Liyanevacia’s contempt for his patronizing tone. “What are you talking about?” Though she spat the words at him, Liyanevacia knew she desperately sought the reassurance he offered. Liyanevacia watched in awe and fear as the sunburst tattoo that encircled one of the fey elf's eyes, began to glow and intensify into a brilliant flare of white light that reached out and devoured the magic of the fimbulwinter shard. Before Liyanevacia could channel her defensive spell, the fey-elf had closed the short distance between them and its wraith-like strength had torn the staff from her grasp. “Enough!” Calanan’s rich bass echoed through the glade. Liyanevacia was not sure if he was speaking to her or the fey elf. “Elarelle, come. Tell us your story. We will listen.” Calanan’s strong arms encircled Liyanevacia’s body once more and pulled her roughly to the ground. Liyanevacia beat her fist once against the hands holding her but before she could strike again Elarelle had knelt before her and begun to sing. The song spelled her. The words chilled her. Do you hear their cruel claws scratching? Do you smell their foul flesh rotting? Do you see their evil eyes flashing? Shh…they are coming. They are coming. Liyanevacia was shaking. She wanted to run, escape the horror, but she could not move. Something was holding her. No, it was not something, but someone. Papa. Papa! Let me go! I do not want to die! Papa! Papa, please! Tears began to fall from her eyes. For you know your papa protects you. For you know your mama loves you. For you know I’ll not let them have you. The grief was too much. She was certain her heart must burst. How could she go on? Her tears blinded her and Liyanevacia’s fingers clawed at her breasts until the front of her shirt was wet with her blood. It was all too much. Liyanevacia lifted her head and screamed until her throat was raw and she could voice her pain no more. Warm hands cupped her face and Liyanevacia was again looking into the eyes of the fey-elf. Liyanevacia expected Elarelle to mock her, but she did not. Instead, a callused finger brushed a lingering tear from Liyanevacia’s cheek and a soft voice consoled her. Elerelle’s bright amber eyes now appeared warm and gentle. Elarelle gently pulled Liyanevacia’s face closer until their lips met. Strangely, Liyanevacia did not recoil from the kiss; this was love not lust. Her heart returned to a quiet rhythm and the ache in her soul was gone. She felt loved. She felt safe. Liyanevacia did not want it to end. When it did, Elarelle spoke. Calanan listened as the two women, fey and elf, plotted death and destruction. He only hoped that Aria would forgive him. Last edited by Kojibear on 26 Jan 2013, 05:56, edited 1 time in total. Calanan was not sure what irritated him more, the Spell Singer’s tardiness or messiness. He stooped down to pick up a discarded robe only to find that it was home to an eclipse of moths. One of the creatures’ startled flights took it directly into Calanan’s open mouth. This combined with the wads of dust he had just inhaled sent him into a fit of coughing and gasping as he desperately sought the skin of wine the Spell-Singer had left him. After what seemed a cruel eternity, when the wine had given him his breath back, Calanan looked about the room and heaved a great sigh. Not of relief, however, but utter defeat. His frantic convulsions had returned the floor to its original chaotic mess. The path he had laboriously spent the entire morning clearing away so that one might walk unopposed from the door to the window was gone. The Spell-Singer, as was his way, chose that untimely moment to return. And unfortunately, his entrance was not by way of the door. Salamandar–the–eagle swooped in through the window at such a speed that avoidance was impossible. Calanan threw one arm across his face. He felt the brush of feathers, heard the furious beating of pumping wings, turned and peeked though his fingers to see the bird crash into the door at the other end of the room. Slowly, as though a puppet master were brining a marionette to life, the Spell-Singer, Salamandar, rose from the floor. Calanan took another swig of the wine in preparation. That was the other thing Calanan disliked about the wizard – that damned demeaning wit. “Because I am the only one able to abide the smell in here?” Calanan took another mouthful of wine. The Spell-Singer had a point. Considering the amount of time they had been spending together alone in his chamber, well, one might make assumptions. Calanan made a promise to himself to start taking his role more seriously. He had lost everything except this one chance at redemption. If he must grovel, beg, plot and serve, then so be it. Salamandar looked at him with what might have been pity, but turned away too quickly for Calanan to affirm it. The Spell-Singer had turned his attention on to a shelf at the back of the room. The way he moved his head slightly from side to side as he sought whatever it was he was after, put Calanan in mind of a bird of prey. He wondered if the habit was a natural one or a result of the Spell-Singer's constant shape changing. When Salamandar had finally located what he desired, the Spell-Singer made his way across the room with an assurance that astounded Calanan. Not once did Salamandar look down and not once did his feet touch anything. “There is order in chaos if you know where to find it.” The Spell-Singer must have presumed Calanan’s surprise. “Master?” The Spell-Singer prompted, his tone was still even. “And not nearly as satisfying for its orchestrator. Ah ha!” The Spell-Singer snatched something from the shelf. Salamandar appeared to lose none of his joviality, much to Calanan’s disappointment. The Spell-Singer chose yet another unseen and unimpeded route to a small table that sat near the window, and then motioned for Calanan to join him. Calanan agreed. There was no point in expressing his impatience further. He really should have known better. The Spell-Singer, for all his eccentricities, kept to a very strict routine. They would drink first before any work would be done. Calanan took a seat opposite Salamandar. As his hand came down to rest on the arm of the chair, he felt something wet and sticky. Bird droppings. “I didn’t say anything,” Calanan began to offer. Unfortunately, Salamandar was not finished. “Besides, you were standing right in front of the window. You’re damn lucky I managed to turn in time. Did you expect me to come in through the door?” The Spell-Singer began flapping his arms up and down. “All right,” Calanan showed Salamandar his open palms. “You made your point.” Calanan could not help but smile at the wizard’s imitation. Later, that brief moment of mirth would shame him. He had had no right to it. The Spell-Singer, however, seemed pleased with the effect he had. This, too, was a part of the Spell-Singer’s daily schedule. Of all the Salamandar’s wonts, Calanan hated this most of all. He turned his head away from the Spell-Singer and looked out of the window. He gave the same answer he had given all summer. “Pain and loss are all I have left. Leave it be, Salamandar.“ Calanan knew it was best to change the topic quickly. Without pause, he told the Spell-Singer all that had transpired the night before. Only a few times did Salamandar interrupt him to ask for a little more embellishment and detail. When Calanan had finished his account, Salamandar, too, looked out of the window. Calanan knew that the Spell-Singer was weaving the happenings into his threads of divination. Calanan had drunk half of the wine when Salamandar finally ended his quiet prophesizing. “And under whose banner do we ride Sing...master?” Calanan asked. Instead of answering his question, Salamandar refilled both of their cups with the last of the wine. Calanan did not drink; he waited for an answer. “And what of yours, master?” Calanan asked sipping his wine. Calanan watched the Spell–Singer’s features turn severe. The wine in Calanan’s mouth turned sour. He tried to read into the wizard’s expression for some hint of his destiny. Was that pitiful look Salamandar had given him earlier a forewarning of his failure. No! Calanan forced the wine down his throat and forced the bitterness of his doubt with it. I will not fail, he thought. Destiny, fate, Athel Loren, lords and wizards – they can all be damned! Last edited by Kojibear on 10 May 2014, 10:56, edited 3 times in total. Sacrifice. It is a word bandied about around the fire. Some think it when they pass their last morsel of meat to their neighbor. Others might sing of it when they recite the tales of old. A few request it when they ask for yet another final encore from the troop of exhausted performers. It is given other names, of course, generosity, courage and devotion, for even in these lesser forms we fear it. Why should we tempt fate to ask of us a true sacrifice? For true sacrifice rewards neither the one who gives it, nor the one it leaves behind. True sacrifice will leave the souls of the dead and living black and empty. An arrow into its shoulder to incite its fury; its rage feeds my own. Avoid its clumsy cleave and drive a dagger into its thigh. Make it lame. Side-step its stumbling slash and plunge a second dagger into its groin. Hear the agony in its guttural braying. Silence it with a kick to the head. Its hands reach up to examine its shattered jaw. My spear slices into its exposed stomach and its hands drop to contain its spilling entrails. Then I come. The strongest shall finish the prey. Yes. Then you come. Fangs will puncture deep into its skull. Hot blood will fill our throat. It is good when it is warm and fresh. The Pride will be strong. My little ones will play with the horns. You mean you will play with the horns. You try to change the topic. What do you think of our new huntress? Noisy. She scares the prey. Hardly. Besides, I do not fear what I cannot see. She has left the pride. This is good. She seeks other prey. I think you are jealous. Of course it is. Now, are you going to get our meal? Other predators stalk our prey. I have no wish to lose this meal to a pack of whining wolves or an ill-tempered bear. Of course, I am a lion. Elarelle reached a hand up and scratched behind the lion’s ear. He turned into it appreciatively. She could not fault his logic, not when the direst of wrongs in his world was undeniably more honorable and than the least in her own. Stop that! The lion pushed his muzzle into her face. The wetness of his nose was a welcome discomfort. You are too bound to your past when you should be thinking only of the now. If I let you, you would choose to herd our prey into the mire pits and follow them in. This is not good. I want to dream of fat doe and my fatter stomach not big rats and rotting carcasses. Because you are a lion. Because you are a stupid. 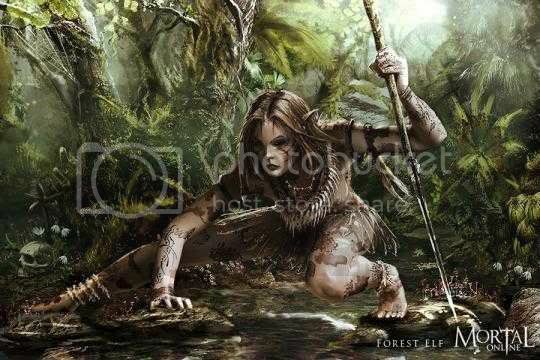 The forest was alive around her, creatures of the night all proclaiming their existence. It was a familiar sound, yet their calls seemed weak and halfhearted. Even the trees around her seemed lifeless; the branches sagged as though pining for the perfect utopia that their cousins enjoyed over the mountains, in Athel Loren. Not so perfect, she told them silently, but it will be, very soon. The branches around her rose and fell, sighing she imagined, at the mere thought of her home. Elarelle began a slow circle of the scouting Beastman. She scowled as a change in the wind caught its stink and brought it to her. This creature’s stench was particualry vile. The smell touched a bruise of a memory that had refused to fade. Concentrate on the now, on the hunt. The lion’s scolding brought her back but some of the pain of the memory still lingered. Elarelle drew the bowstring back much further than she knew was necessary. The arrow could go right through the bone. Oh well, Orion did not demand finesse in the hunt, just devotion and death. Of these, she would give her King plenty. Elarelle released the arrow. 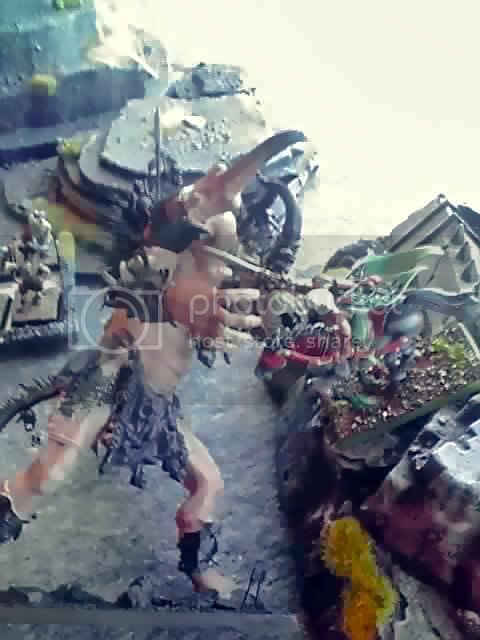 It struck its target but did not go through the Beastman’s shoulder. Nevertheless, it was buried deep and the creature's agonized roar awakened Elarelle's own frenzy. She, too, howled her rage into the night. The Beastman having mastered its pain, now stood brandishing its cruel axe. Blood was pooling and running from the hollow between its massive chest and arm. Elarelle hungered for it. The Beastman bellowed a challenge, a low guttural roar that no doubt had meaning in its horrid tongue. Elarelle stepped slowly out of the undergrowth and revealed herself to it, disregarding surprise to accept the beast’s invitation. It looked at her with dim, wild eyes that rolled back in sick pleasure and wicked anticipation. Elarelle had received the same look a hundred times. Her heart began to race. The will of Kurnous lit her eyes with furious faerie fire. She smiled and watched her wild reflection in the black eyes of the Beastman. The creature of chaos tried to hide its sudden unease by snorting and snapping off the shaft of the arrow lodged in its shoulder. But it could not hide its fear from her, nor from Kurnous. It was once a man, but it had become a chaotic creature of evil, a beast, an animal, and the changed look in its eyes told Elaraelle the truth. It was scared. It knew it was prey. And for the hundredth time, Elarelle taught the beast fear, pain and a terrible, merciless death. You did not give me the kill. Elarelle heard her throat rattle in answer to his reproach. The lion responded with his own low rumble. Get away! I am first! Only after he had knocked her down with one of his powerful paws did her elf-self slowly begin to return. It was becoming more and more difficult to do so, and soon she feared she would not be able to return at all. The lion turned its head to look at her. Its mouth was full of the beastman’s entrails. Then you should not be an elf. Always, his simple and pure lion logic tempted her. It would be much easier. She could give herself to Kurnous completely, end the battle of wills and the terrible memories she still clung too. Yes, and more dreams of fat doe and fat stomachs. Not yet, she thought to her lion. Soon. Then we will dream of more rotting rats. Just for a little longer. The lion shook its mane in a gesture she knew conveyed its distrust and disbelief of her silly elvish thinking. Finish your meal, or I will have that too, not lion. Elarelle looked down. In her hand was the beastman’s half-eaten heart. Last edited by Kojibear on 26 Jan 2013, 05:57, edited 1 time in total. Elarelle had happened upon the intruders at the same time as the band of scouting Asrai. These elves were unfamiliar to her, but enough of her elf-self remained that Elarelle could recognize the unicorn sigil of Lady Lloerganiel the Half-Elven. Like her, these elves remained hidden to the prey. She wondered if the forest’s fury was calling to them as loudly as it was to her. Doubtless, she thought, the dumb ears of the men and dwarves in the clearing ahead heard nothing. But how could they not? To Elarelle, the forest’s fury was a deafening call for violence and retribution. She knew the beasts of the wood had heard it for soon they answered the summoning with their own angry cries. Somewhere above her the shrieks of a pair of great eagles pierced the air with the same ferocity that Elarelle’s spear thrust into the chest of the unwary human scout that had been good enough to stumble upon her. The eagles’ screeching drowned-out whatever final prayers or curses the man threw at her, before her lion’s jaws silenced them for good. Liyanevacia’s divine mandate was clear; all must die, and if Elarelle had ever doubted it, she could not do so now. The forest itself was giving its consent. All around her the trees began to bend and break, their limbs twisting and curving at unnatural angles until they began to take on female forms – dryads – and they tore themselves free from the trees in a frenzy of screams and claws. Elarelle bent down and severed what remained of the human’s head, held it aloft and howled with them. It was not enough for her. She was yielding to her King’s hunger. 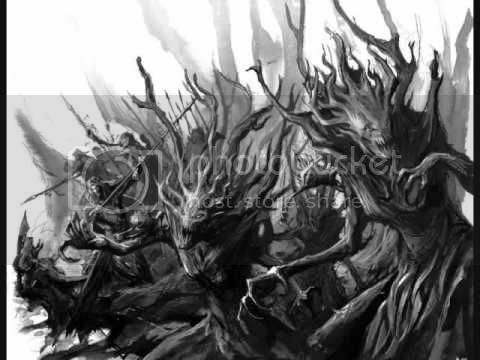 Louder and louder she and her fey sisters sang the song of Kurnous until at last they had roused the forest’s most terrifying and destructive defenders. A great cracking heralded the monsters’ coming. 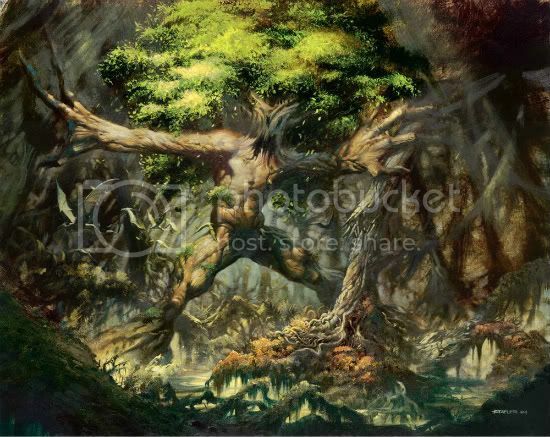 The trunks and boughs of ancient pines, spruces and aspens came to life as hulking treekin, but it was only with the thunderous entrance of a colossal treeman that Elarelle and the dryads ceased their murderous choir. And yet only a moment passed before the call for blood was taken up once more, this time by Lady Lloerganiel’s Asrai. Yes, agreed Elarelle, the time for hiding was done. Kurnous was demanding blood from the hunt and she and her fellow elves must sate him. A new and ugly sound suddenly broke the Asrai's battle cries, the pitiful beat of shod horses bearing their brutish captors. How fortunate that the prey was coming to her. Last edited by Kojibear on 26 Jan 2013, 05:58, edited 1 time in total. It was a beautiful late summer day and two things were ruining it for him, the battle raging below and the woman gloating beside him. She was of noble blood, beautiful and insufferably aware of it. Today she had chosen a dress the colour of polished jade with raspberry trimmings that perfectly matched the colour of her lips. The cut and style of the dress, he thought, illustrated this woman’s nature perfectly, long and elegant, concealing all that lay beneath. But a slit in the side of the dress that ran from hip to ankle teased the onlooker with brief glimpses of the prize that could be his if he were worthy enough. Or foolish enough, he joked with himself. Salamandar desired her – any male would – but fortunately for him he knew what she really offered, and it was ugly, and rotten. No doubt he would find more warmth at the top most peak of the Pine Crags than in this woman’s cruel heart. If the praying mantids ever desired a queen, the Lady Liyanevacia would be she. Her smile chilled him. But he had no choice; salvation always depends on sacrifice. He took his eyes off of Liyanevacia's disturbing grin and instead surveyed the progress of the battle in the glade below. The presence of the outsiders was of no surprise; his recent fate weavings had told him as much. But he could not fathom what had driven the men and dwarves to travel so close to the borders of the forest. Well, whatever the reason, they were paying for it now. Elarelle’s frightening rage had quickly roused an army of fey to attack the ill-fated trespassers. It was as though the men and dwarves had stepped into a pit of angry vipers, and the first bitten had been the Empire’s scouting huntsman. No doubt the wild-men had been looking for threats between the boughs and branches when they should have been looking at the trees themselves. 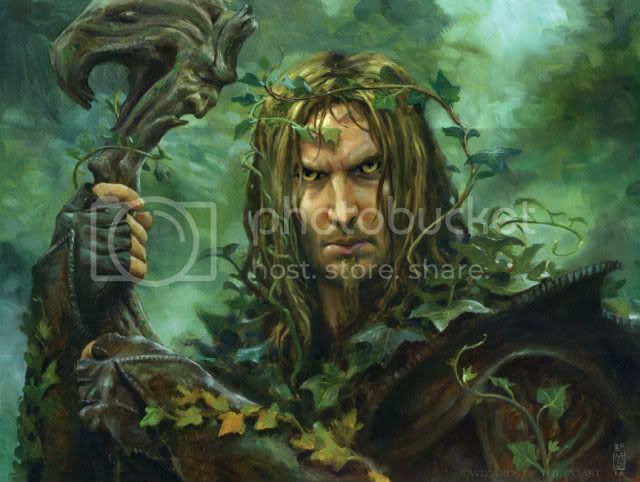 The first man had been torn apart as the dryads fought for the first taste of blood and bone. Elarelle herself had decapitated the tragic fool. The Lioness’ madness now infected the intruders with the very recklessness and unrestraint she had succumbed to. The air thundered and the ground shook as the armoured warhorses bore their slavers to face the fey pride of the Lioness. To Salamandar’s relief, at least one of the humans appeared immune to the folly unfolding around him. The man wore no helm and his decorous bearing seemed at odds with his barbaric appearance. The words he brought forth reverberated through the glade with such authority and power, that the eagles circling above cried out in distress before dropping from the sky. The knights rallied to this mystic man’s call, forcing their frothing mounts to take a new path, one that would lead them away from the glade and away from Elarelle’s madness. Salamandar felt his heart lurch again when one of the plummeting Eagles hit the ground directly in the path of the fleeing horses. The raptor tried to take to the air but it had fallen heavily; its wing was most likely broken. One defiant cry was all the noble creature managed before it was crushed beneath the hooves of a dozen horses. The other eagle dragged itself awkwardly over to its lifeless mate and tried to nudge life back into the broken body with its beak. Salamandar’s hands curled into fists as tears began to run down his cheeks. He wanted revenge, to kill – no, to destroy – these barbaric invaders. A spell began to form on his lips, but Liyanevacia stopped him, her cool fingers turning his face away from the dead eagle. She forced his eyes on the glowing stone of her staff. As quickly as the call of Kurnous had stolen his control, the Fimbulwinter Shard gave it back. With the return of his senses, so came his awareness of Liyanevacia’s intimacy. Her green eyes were searching his own. His desire for her was screaming for him to kiss her. Salamandar realized his weavings had failed him. He had not seen this. That sobering thought broke through his desperate hunger and he stepped back from her. Like a wolf bearing its teeth, Lady Liyanevacia’s innocence vanished. Thinking of his all too recent loss of control prompted his honesty. “Perhaps I am weaker.” Before she could belittle him more Salamandar leapt from the cliff and then rose again as Salamandar eagle. Despite his desire to flee the bloody scenes below, his curiosity briefly won out. Circling the glade he saw that the arrival of another Asrai scouting party had destroyed any hope the men and dwarves had of escaping. Caught between Elarelle and her shrieking dryads, and the frenzied Asrai, the Empire knights’ situation was hopeless. Nevertheless, they fought on and Salamandar felt a grudging respect for the cool commands and unwavering faith of the bald mystic. But it was the blood of the forest and of elves that dulled the armour that had once glittered in the sun and reflected the glory of the great Empire. Salamandar's respect for the humans clashed with his desperate wish to see all of them dead. What happened next revealed to Salamandar the true extent of the Lioness’ formidable influence. A band of Asrai bowmen suddenly abandoned their high vantage point and all reason, dropping their bows and wildly charging the knights. From his lofty vantage point, it was as if the wood elves had run headlong into a wall of jagged metal, the call of the hunt rewarding them only death at the end of a steel lance. One hysterical elf gripped the lance that pierced her chest and pulled her ruined body along its length. The stunned knight hesitated a moment too long and with her remaining strength the female elf drove her short sword through the narrow gap in the man’s helm. The two of them dropped to the ground, an odd stillness amid the furious combat around them. Salvation, Salamandar reminded himself, demands sacrifice. There was no need for him to stay any longer; he had already seen the outcome and there would be plenty more death to come. At least on this he was forced to agree, their champion’s journey had only just begun. Last edited by Kojibear on 15 Feb 2013, 01:29, edited 3 times in total. She was the image of Asrai nobility, beauty and grace in equal measure, with just the right amount of subtle threat and elusive promise. I know your type, he thought as she sauntered seductively towards him, they tried to make Aria just like you, but her heart was too good. And yet despite all her familiarities, two things struck Calanan as being odd about this daughter of the Pine Crags. The first, her raven locks and lotus skin, he could put down to the wayward trysts of her mother. The source of the second peculiarity, however, still eluded him. All creatures feared something; even a bear must fear its own appetite. But Liyanevacia seemed to fear everything and it oozed out of her like a festering wound. Oh, she hid it well – the nobility were good at that – but she could not hide it from him, and that he reasoned was why she feared him most of all. It also explained her annoying efforts to bed him. Her first words to him were a sad irony. "I fear our ardent champion may need firmer direction. Go, and when she is done, bring her back to me." "You do not trust him then." She had a point. Salamandar’s motives were even more of a mystery than Liyanevacia’s irrational fears. "I’m supposed to be his apprentice. How shall I explain my absence?" "I’ve already arranged your excuse. You will be our emissary to the Lady Lloerganiel." "What makes you so sure that Elarelle will even listen to me? I know what happened, what she did. If Lady Lloerganiel suspects something she will come looking for answers." “Lady Lloerganiel is not like other highborn; she is smart." Her ugly words made Liyanevacia's beauty suddenly seem repulsive and Calanan turned his cheek away from her violating hand. Well, at least the choices she gave him were simple. “Do not fear my Lady.” Calanan let just enough patronizing tone slip into his reply to satisfy his contempt. “I will do anything, for her.” He turned and walked away, not stopping when she had the last word. Everything, he admitted to himself. Everything. Finding Elarelle had been easy; he had just followed the heralds of death. The crows were her disciples and she had fed them well. Even now they circled above, no doubt wondering what would be served up for the next course. The answer came soon enough, Beastmen. He should have known Elarelle’s madness would lead her to these monsters. Three crows cackled their impatience as they circled the battlefield. Well, he thought, three arrows were in flight, three chances to hit the mark, and he had always liked that number. Of course, there was always the chance that the arrows would strike each other, sending all astray. Oh well, there is no fun in certainty. Salamandar leapt from the cliff to become salamander eagle, but before leaving he dove once into the midst of the crows, earning himself a harsh rebuke of cawing. He had never liked crows. The two forces, fey and beast met head on in a chaotic clash of metal and claw. There was no strategy, no plan, nor any line of attack. What Calanan was witnessing was the primal fury of two savage forces, and he knew his task would not be an easy one. His horse shook its neck and stamped its hooves. ‘Yes, yes, Naira’, he soothed, ‘I hear you now’. Their bond was newly formed so the horse was practically shouting her thoughts at him. It did not help that he was distracted. Now that he had calmed down, Liyanevacia’s parting words had begun to worry him, and his anxiety and inattentiveness was annoying his horse. ‘I don’t like the smell either.’ Calanan gently stroked Naira’s neck but her ears went flat. He tried patting her instead; she liked it. ‘If only Liyanevacia were so easy to please.’ The horse shook its neck and snorted a response. ‘You and I both my stormy friend. And I would if I could.’ Calanan thought it a peculiar omen that the colour of the Naira’s coat was the same grey as the storm clouds rumbling above. Come, he urged her, be swift like the winds that have coloured you. Calanan’s small band of riders followed him as he raced to the right flank of the battle. Trusting his horse to choose the path ahead, Calanan looked towards the centre of the battle. Elarelle and her fey allies were surrounded by a horde of Beastmen. The initial shock of the Lioness’s charge must have been short lived, for the beasts’ fury was such that they were all pushing and shoving their way past each other to reach the front lines. But their battle rage was nothing compared to the vicious axe-wielding brute that was cutting a path through its own herd to get to Elarelle. And yet, the standard it was brandishing was far more distressing. Atop the crude spear and bloody rags was the decaying head of an elf, its eyes and mouth locked in an expression of horror and pain. A dark cloud seemed to surround the head and for a moment Calanan thought some dark magic was at work, but when the beastman champion used the spear standard to impale one of its own wretched kin the cloud seemed to disapate, only to reform around the head once more as the beastman continued its violent path forward. Flies, he realized, were swarming the rotting head, a further desecration of the dead. Calanan was not the only one to make the disturbing observation; the other riders cried out curses and promises of revenge. But Calanan could not afford them their wish. Leading the Asrai riders further from the combat, he earned himself a short volley of condemning curses and accusations that were one by one replaced with gasps and prayers as the Asrai riders’ finally took in the greater evil that was before them. Calanan did not fault them for lacking in nerve, for this was no distorted man turned beast, but rather a true offspring of Chaos, a Ghorgon. It was a thing of nightmares, a hulking, multi-limbed servant of slaughter, and Calanan was leading them right to it. Calanan’s first reaction required no thought or second-guessing, and for once he gave a reluctant thanks to his infuriating benefactor; a magical arrow being Liyanevacia’s parting gift. He let the thing of magic loose and gave a quiet prayer to Kurnous that his aim be true, though it immediately proved impossible to tell; the magical arrow burst into a dozen shafts of arcane energy that hit the Ghorgon with a synchrony of blinding flashes and thunderous detonations. But it was all for naught. When the noise and magic faded, Calanan groaned in defeat. The magical arrows had struck true but the shaft riddled Ghorgon lumbered onwards, towards Elarelle and the Dryads. Elarelle, Calanan saw, was now locked in combat with the Beastman standard bearer, unaware of the threat bearing down upon her. If this creature reached the fey, Calanan was certain they were doomed. An urgent tugging by Naira at his consciousness made Calanan aware of the more immediate danger. ‘Alright, alright.’ Ahead the ground rose, giving way to a rocky knoll that now partially obscured the Ghorgon. ‘Slow yourself, rest.’ Calanan was grateful when she let go of his mind and slowed her breakneck pace; he needed to think. The other riders had likewise reined in and were already debating amongst themselves on what to do about the seemingly unstoppable threat. Calanan saw only one outcome. Letting that monster reach the main battle could not be allowed, but he could not engage in this madness alone. “Wardens of the Wildwood! What do you see? A beast? A Monster? Our ruin?” Calanan had their attention now. “Perhaps it is because I am not of your kin, for I am a son of the Craggs, and all I see is an abomination, a vile affront to the beauty of Ariel and an insult to the purity of Orion, and by Isha and Kurnous, I will see it pay in blood for its sin! Do the sons and daughters of Coeth Mara follow me, or do you put the will and honour of your King and Queen into the hands of others?” The riders all took up their spears and cried out their loyalty to King, Queen and Forest. Calanan lifted his own spear and added his own call of battle to theirs. The horses began to stamp their hooves as he roared, “For your King and Queen! Return the balance! End this mockery of life!” Calanan turned his horse and charged at the Ghorgon. He hoped the other riders were with him. Calanan and Naira were the first to reach the base of the rocky knoll, but instead of going around it, he urged his horse to go forwards, up and over the treacherous slope. Any other horse, he knew, would resist such recklessness but Naira was an Asrai courser and she would trust in his commands until her heart broke, just as he must trust in her skill to carry them out. Calanan had heard the many fables of the impossible feats of the riders of the south, but he knew now they were all true. The knoll's gravelly surface was another enemy, one they could not fight, and yet not a stone nor pebble moved as the riders of Coeth Mara and their brave equine allies seemed to fly up the rocky knoll. Calanan, however, could only hope that Naira had enough skill for the both of them. Clearing the top of the knoll, Calanan and the other riders began their descent down the other side. He urged Naira to increase her speed and felt her body gather beneath him, and her speed redouble as they closed in on the Ghorgon. But with a quickness that defied it's hulking shape, the Ghorgon spun around and stamped one massive hoof into the ground. The impact shook the earth and loosened the gravel. Naira stumbled but managed to keep her footing. The horses to either side did not, and the crueler cost of their misfortune was the lives of the riders and horses directly behind them. Calanan heard the sickening screams of both horse and elf as they were either broken as they fell or crushed underfoot. But there was no time to grieve. Calanan collided with the Ghorgon. Calanan’s attempt to drive his spear into the giant’s unprotected thigh ended in disaster, for at the last moment Naira darted to one side to avoid one of the Ghorgon’s sweeping clawed limbs. The horse’s deftness had saved them both from being split in two, but the sudden move had caused Calanan’s spear to instead hit the Ghorgon’s granite-like hoof. Pain lanced up his arm, temporarily blinding all vision and thought with swirling embers of pain. Again it was Naira that saved him, as she leapt once more to avoid the backhand swing of the same clawed limb. Thankfully, too, the jolt returned Calanan back to his senses. Taking stock of the fight, he saw another three Asrai riders were already down, and another he was forced to watch as the Ghorgon hooked her cloak with its claw and pulled her free of her horse. The female rider struggled and fought for the last moments of her life, even managing to draw her short sword as she was tossed into one of the beast's monstrous hands. She was crushed, like watching a fist wrap around an autumn leaf, and then the mass of bloody flesh that remained was shoved into its fang-filled maw. The attack of the four remaining Asrai and horses faltered as they instinctively drew back in shock and horror. But they were backing up to the edge of the knoll. As soon as the riders and horses felt the ground begin to slip underneath them they realized their terrible mistake. When the Ghorgon struck, the horses were helpless. Charging down a sliding slope was one thing, trying to fight on one was another thing all together. Calanan saw two horses fall within mere moments. The riders tried to leap free and one even managed to land on his feet, only to be impaled through the chest. The elf’s eyes went wide and blood began to fill his mouth. More spewed forth as the Ghorgon lifted the elf into the air and then threw his devastated body at the last two riders. Calanan did not wait to see if they had managed to evade the gruesome missile. He charged the Ghorgon once again. Yes, the beast was faster than it looked, but Calanan had to hope that it could never hope to match Naira’s gale-like pace at full gallop. Naira knew his plan and it was yet another testament to her courage and trust that she would let him go through with it. The giant’s head turned seconds before its body followed and that was all Calanan needed. As the expected claw came at them Naira leapt and so did Calanan, using all of her speed and lift to launch himself at the Ghorgon’s face. Gripping his spear at its base with both hands, Calanan drove it, tip and all, through the chaotic beast’s eye and into its brain. Calanan fell and the creature of Chaos fell with him. Dead. How long Calanan had lain still he was not sure. It could have been seconds or days he was so exhausted from the pain and horror. Finally, a wet muzzle nudged him back to consciousness. Calanan had thought he could never love something as much as he did his Aria, but this horse was getting very close.